Posted on September 11, 2018 at 1:59 pm. 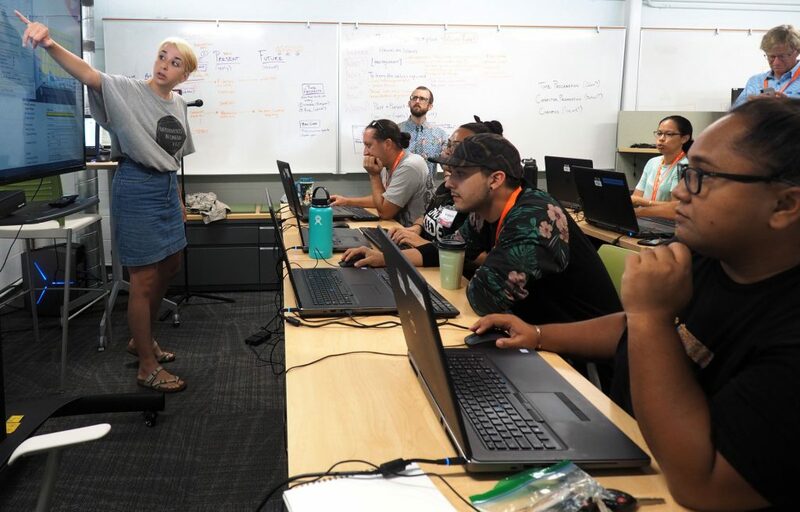 This summer, from July 3 – August 3, a team of instructors made up of AbTeC staff delivered our sixth Skins workshop on Aboriginal Storytelling and Video Game Design. Now back at our lab and studio in Montreal, the they are putting the final touches on Wao Kanaka, I ka wā ma mua, ka wā ma hope, the game made by Ka Lei Milikaʻa–the He Au Hou 2 cohort–during our workshop at Hālau ‘Īnana in Honolulu, Hawaiʻi. This year’s workshop was the result of our successful partnership with Kanaeokana and Kamehameha Schools. Kanaeokana is a network of Hawaiian organizations that works to strengthen a Native Hawaiian education system, ingrained in ʻōlelo Hawai‘i (the Hawaiian language) and ʻike Hawai‘i (Hawaiian worldviews). Kamehameha Schools directly educates over 6,900 K-12 Native Hawaiian students at multiple campuses and pre-schools throughout the state; they reach an additional 40,000 learners through other collaborations and programming. The AbTeC staff are comprised mainly of Concordia students. We feel very lucky to have such talented and caring young people that we can bring with us into an experiential learning environment. We believe that while they are helping us deliver the workshop, they learn about teaching and cross-cultural communication, hone their own crafts and, we hope, make lifelong connections. In this light, we asked the five Research Assistants who joined us to share their experiences and write about what they learned at He Au Hou 2 / Skins 6.0. Graduate Research Assistant Maize Longboat (third from right) shares his take on the game. Also pictured, from left to right, are Pono (a participant’s son); Skins staff instructor Victor Ivanov; and A’ali’i Kelling, participant. My name is Maize Longboat and I am Mohawk from Six Nations of the Grand River. I served as the Assistant Producer of Skins 6.0 in the periods leading up to and immediately following the workshop. Under Nancy’s expert direction, my responsibilities included organizing curriculum documents, managing the packing of vital equipment and materials, conducting communications and liaising with participants and staff. My Master’s research takes a practice-based approach to the study of Indigenous video games. Because of this, Jason and Skawennati offered me the possibility to attend this year’s workshop as a Participant. Having the opportunity to not only support the organization of the workshop, but to also get hands-on experience was very important for me. I especially valued learning the details of what it takes to actually make a game from beginning to end. From story and art, prototyping to programming, making games requires a lot of varied expertise and interdisciplinary cooperation. Being a part of Skins was vital for my personal growth as a game developer and researcher and I’m so thankful to have been a part of the game’s creation process. I learned that I really enjoy prototyping game mechanics that align with the broader themes of game narrative. I worked closely on our Loko I’a (fishing) mini-game alongside another participant, Charmaine, to develop game mechanics that reflected managing food supplies. We wanted to teach players how to take only what they need, in order to ensure a bountiful future for their descendants. Lastly, I learned that my fellow IIF Research Assistant colleagues and workshop instructors are patient and thorough mentors who cared about everyone’s learning experience. I thank them deeply for their generosity, guidance, and friendship during and after the workshop. My fellow participants brought their good minds and work ethic into the workshop space everyday. 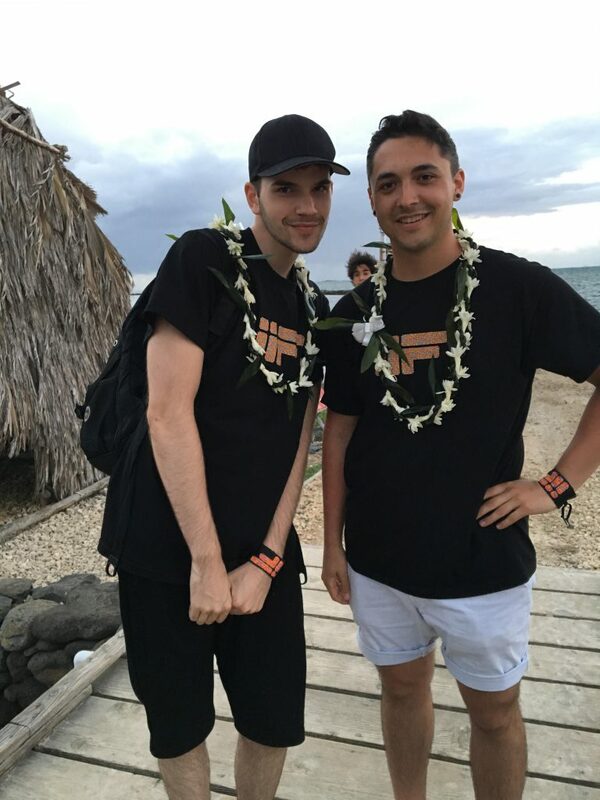 Their desire to create a game that everyone could be proud of is clearly visible in the final product; it was because of their dedication and abilities that this game is as awesome as it is. I’m also happy to say that I made great friends along the way and I’m looking forward to witnessing how everyone utilizes the skills learned in this workshop in the future. Speaking of skills, I learned that programming isn’t as complex as I thought that it might be! Obviously, it takes a lot of time and practice, just like any other language, but I now feel prepared to work with game code in my future projects. What a pleasant surprise! I hope to see the partnership between IIF and Kanaeokana flourish as they conduct more collaborative creative projects. The two games produced in the past two years are fantastic examples of what Indigenous peoples can do with new media technologies when encouraged to build their capacity as creators. Nia:wen for the opportunity to contribute as both an IIF staff member and workshop participant! Undergraduate Research Assistant Ray Tqoqweg Caplin (right) worked closely local instructor with Vance Martin (centre). Concordia Professor Rilla Khaled (left) led the assessment team. My role in Skins 6.0 was the 2.5D Cinematics Tech Lead and Instructor, which included camera work and the creation of background assets in the game’s cinematics, as well as instructing participants in how to write, design, and construct the artwork. My other responsibilities included teaching Photoshop and After Effects to participants, as well as lending my artistic skills when necessary. 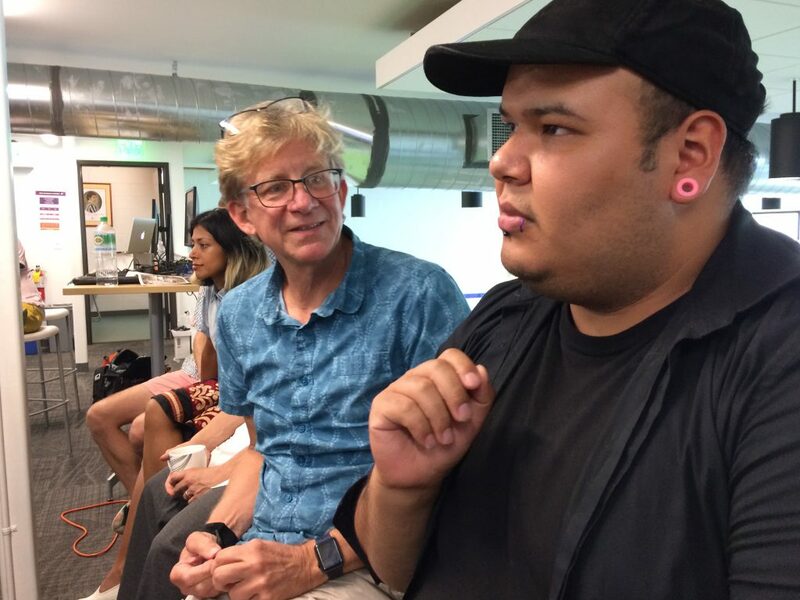 I taught alongside one of the local staff, Vance Martin, who has decades of experience in television and corporate film production. We made a great team; his experience in technical production, coupled with my experience in artistic vision and expression, complimented each other, providing a balanced learning experience for the participants. I learned several things during the workshop. For instance, being comfortable with speaking in front of others: I’ve always had trouble accurately expressing myself in front of large groups. Two things that really helped me through the course of the workshop were being better prepared before speaking, and, with each day, becoming more familiar with the participants. The participants who were a part of the Cinematics team were friendly, passionate, and came well equipped: all had a basic knowledge of the software we were to work with, so it was enjoyable to expand on that knowledge since they were so eager to learn and help with the project. Thanks to Vance, I gained a lot of experience in After Effects and general rules of production workflow. He consistently showed me things I didn’t know about the programs or workflow planning. His many years of experience left a great impact on both the participants and I.
Undergraduate Research Assistant Sam Bourgault gives a lesson. Pictured from left to right are Ikaika Bishop, Pippin Barr, TaraMarie Panoke, Maize Longboat, Leslie “Kehau” Agena, Charmaine Woodward, and Vance Martin. Hello! My name is Sam and I was the Programming Lead for Skins 6.0. This role involved teaching lessons to familiarize the participants with Unity 3D, the game engine. I also taught some programming lessons to introduce the basics of code logic. I worked closely with Skins instructor Victor Ivanov and local instructor Corey Chang, which helped us give coherent lessons. During these three weeks of fun and hard work, I realized how important it is to create a warm social context to foster learning. We were encouraged to share thoughts, food and free time with the participants, which really strengthened our ties to each other. This group cohesion was visible in the participants’ enthusiasm for the lessons. I also noticed that it is more productive to congratulate learners when they’ve achieved something they hadn’t tried before, rather than getting lost in the details of any given topic. In this way, participants build confidence and aim to tackle new challenges. The participants of Skins 6.0 were striking in many ways: always motivated to learn new technical skills, emotionally intelligent, and culturally wise. They made me think a lot about my own culture, my relation to the land and my links to colonization. The whole experience deeply inspired others and myself. I believe that, in the end, inspiration is the most valuable thing we have to trigger changes. Undergraduate Research Assistant Victor Ivanov and Graduate Research Assistant Maize Longboat strike a pose! My name is Victor Ivanov. For Skins 6.0, I took on the role of Level Design Lead, and I played active roles in the programming and audio units of the workshop. I taught Level Design Theory, covering topics such as how narrative unfolds through environments, stylistic choices, and mood; through this, participants learned how to achieve these effects on a practical level. I also taught some Engine lessons with Sam Bourgault and Corey Chang, where we focused on familiarizing the participants with Unity, a game engine, and its various components. Finally, I taught the Audio and Atmosphere lessons alongside Kauwila Mahi and Matt Sproat, two very talented artists who, with their expansive approaches to making music, created a very knowledgeable and well-rounded team. I firmly believe that teaching is one of the best ways to learn, and the workshop only confirmed this theory! On multiple occasions, a participant would notice something I had not, or have an eye for design and make beautiful levels, or come up with an interesting way to solve a programming problem. I was impressed by how adept participants became after such a short amount of time; that meant that we all were learning. Not to mention, the sheer amount knowledge about the Hawaiian world each of them held was extremely insightful. What was most impressive was how respectful, understanding, and mature everyone was throughout the entirety of the workshop. It allowed a large group of people from different walks of life to come together and make something greater than the sum of its parts, and for that we should all be proud. 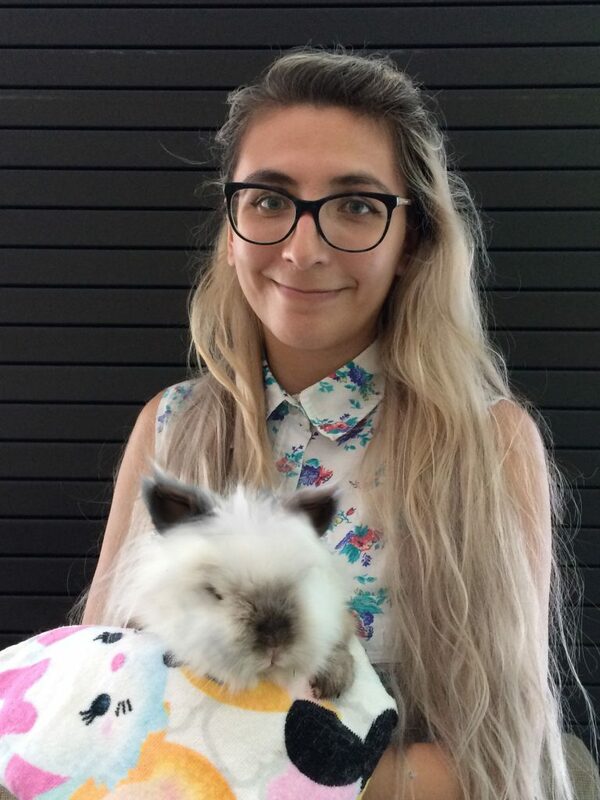 Undergraduate Research Assistant Kahentawaks Tiewishaw holds Bijou the Bunny, Honorary Production Assistant. My name is Kahentawaks Tiewishaw and I’m Mohawk from Kanehsatà:ke. My role in Skins 6.0 was the 3D Lead. Along with my local counterpart, John Mervin, I taught participants 3D modeling, UV mapping, texturing, rigging, and animation. Working with the participants was an absolute dream because everyone was as kind and welcoming, as they were talented and perseverant. Learning these skills in a very short time, and then jumping right into production is no easy feat! I’m extremely impressed with the work they all did. Even though I was an instructor in this workshop, I ended up learning a few things myself. It provided me the opportunity to improve on my technical abilities and teaching skills. When Skins 6.0 began, I naturally had a few doubts about how good of an instructor I would be. Being able to do something yourself and being able to teach others how to do it are two entirely separate things! However, I guess you could say this experience was a bit of a trial by fire, as it forced me to look at things as if I was approaching the software for the first time. This granted me a deeper understanding of my craft. After all, I’ve heard it said that the best way to see if you really know something is to try to explain it to someone else!